The 70-strong crowd marching down Mission, flanked by police officers. Photo by Joe Rivano Barros. 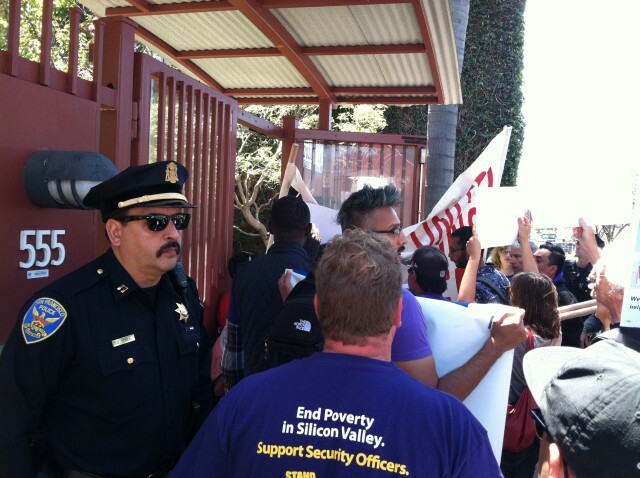 Some 70 demonstrators — including Supervisor John Avalos — stormed the offices of a developer at 575 Florida St. to protest his firing of 32 union janitors at Parkmerced and his so-called “Monster in the Mission” housing development at 16th and Mission. The developer is Robert Rosania, part-owner of Maximus Real Estate, which is behind the 16th Street Plaza housing project. Protesters crowded the sidewalk outside the office complex on Florida, chanting a call-and-response of “Shame on you — Maximus!” before the doors to the complex were opened by employees returning from lunch. The opening allowed demonstrators to rush through the gate. Police seemed to hesitate, at first moving to stop protesters and then allowing the march through the building and to the doors of the Maximus office. There, demonstrators shouted their demands through a bullhorn, calling on Rosania to turn the market rate development at 16th Street into affordable housing and to give the fired janitors their jobs back. No response came from the shuttered office doors, and it is unknown if Rosania was in at the time. Mission Local tried to reach Rosania afterwards without success and received a “No comment” from Parkmerced Apartments. “I think they can hear us. What do you think?” shouted Maria Zamadio, an organizer with Causa Justa, through the bullhorn. Fired janitorial staff and community organizers took turns reading demands before Supervisor Avalos took the stage himself. Avalos added that he opposed the housing being pushed by Maximus at 16th Street, saying it was “not needed in the Mission,” and that he would continue advocating for affordable housing at the policy level. The 16th Street project proposes 380 units, 90 of them affordable. “We have a lot of work to do to make sure we get a Board of Supervisors that looks out for our interests. Let’s win the kind of housing we need,” he said. 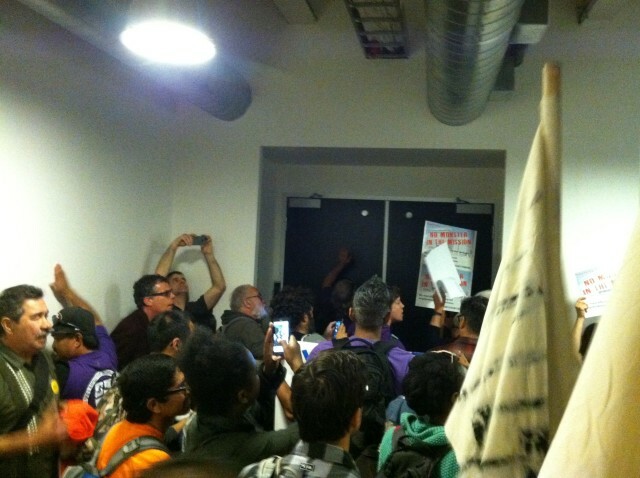 Protesters banging on the shuttered doors of Maximus, shouting their demands through a bullhorn. Photo by Joe Rivano Barros. 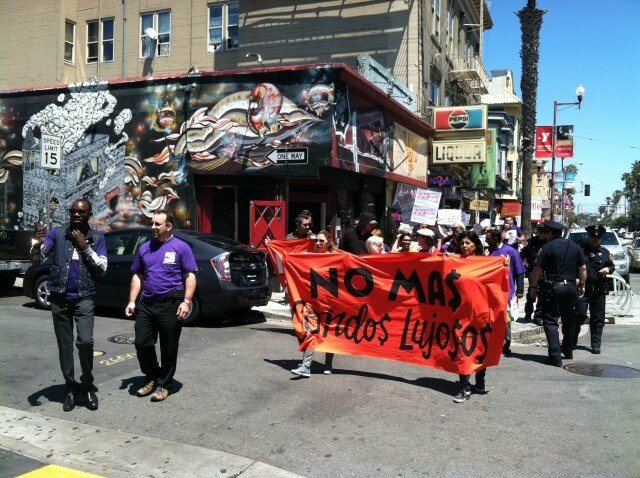 The protest, which started at the 16th St. Plaza at 11:15 a.m. and went down 18th Street to the Maximus offices, was a joint effort by SEIU-USWW (the union representing the janitorial staff), Causa Justa, the Plaza 16 Coalition, and housing rights groups. All came in support of the fired janitors, who were replaced in April by non-union workers under Preferred Building Services. Preferred Building Services is currently contracted for janitorial duty at Parkmerced Apartments, which is partly owned by Rosania. Protesters said the injustice of firing the janitorial staff was compounded by the poor working conditions faced by the non-union workers who had replaced them. “These long-term janitors were terminated and Preferred Building Services brought on non-union workers at minimum wage and without benefits,” said Jane Martin, an organizer with SEIU. Because Rosania is also part-owner of Maximus Real Estate, the market rate housing development at 16th St. and Mission was also a target. 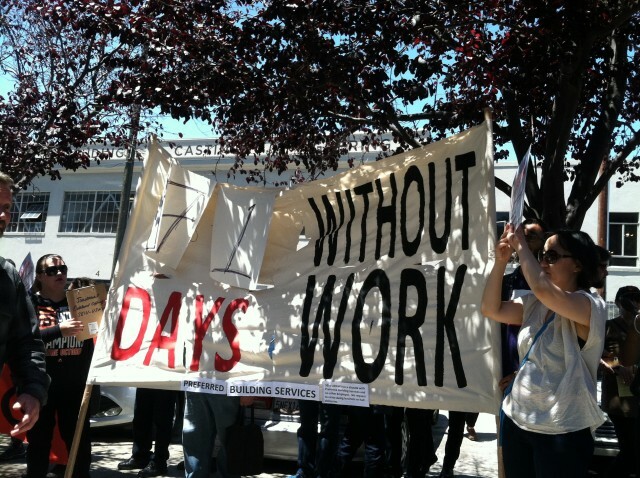 The fired workers have been out of work for 71 days now and say unemployment has taken a severe toll. Fired janitorial staff holding a sign showing how long they’ve been unemployed. They say two of the 32 fired have lost their housing. Photo by Joe Rivano Barros. “Many of us have small children who we’re supporting and many of us have actually lost our homes since we stopped working,” said Nelson Martinez, signaling his former colleague Romilo Domingo marching a few feet away. Martinez had worked for Parkmerced for 14 years and Domingo for 16 years. When asked what they were hoping for, both said they wanted their jobs back.